In a first for South Africa, Dr Lucia Anelich (PrSciNat) has been elected as President-Elect of the International Union of Food Science and Technology (IUFoST), to become President in 2020. She is the existing Chair of the Scientific Council of IUFoST, and currently President of the South African Association for Food Science and Technology (SAAFoST), which is an IUFoST Adhering Body. IUFoST membership consists of 60 adhering bodies representing more than 150 000 food scientists and technologists throughout the world. IUFoST is a member of the newly-established International Science Council (ISC). Concerns about the global food supply are shared by consumers, industry and governments around the world. 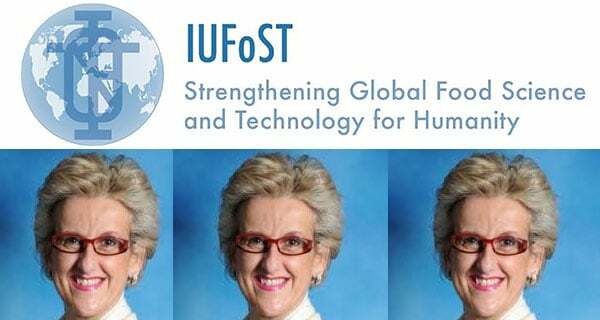 IUFoST is a non-profit, non-governmental, global scientific organisation for food science and technology. Its mission is to promote international cooperation and information exchange, to provide education and training to food scientists and technologists around the world and to promote professionalism among food scientists and technologists. It plays a crucial role by supporting programmes and projects that address worldwide needs specifically in food security, food safety and education. IUFoST aligns with SAAFoST’s mission of advancing food science and technology knowledge, encouraging scientific research and cooperating with all organisations and groups that share the same objectives. Dr Anelich became the first South African woman to be elected as Fellow of the International Academy of Food Science in Technology in 2010, the first South African to be invited as member of the International Commission on the Microbiological Specifications for Foods (ICMSF), and the first female Head of Department of a Food Science and/or Technology Department when she was Associate Professor at Tshwane University of Technology. In 2006, she left the university to establish the first food safety body for the South African food industry with an industry association. Dr Anelich manages her own successful food safety training and consulting business and is currently Chairperson of the Food Hygiene committee at the South African Bureau of Standards. She conducts projects for United Nations bodies and has acted as Food Hygiene expert to the African Union.